Royal Christmas Fair The Hague is an initiative of Walbroek Media & Haagevents and will take place for the fourth time at Lange Voorhout in The Hague, from Thursday 12 to Monday 23 December 2018. The Christmas fair is open every day from 12h00 to 21h00 and it is accessible free of charge. Get off at the stop Kneuterdijk, 50 metres from the Royal Christmas Fair. Get off at the stop Gravenstraat, 100 metres from the Royal Christmas Fair. Get off at the stop Malieveld, 300 metres from the Royal Christmas Fair. Get off at the stop Korte Voorhout, 200 metres from the Royal Christmas Fair. 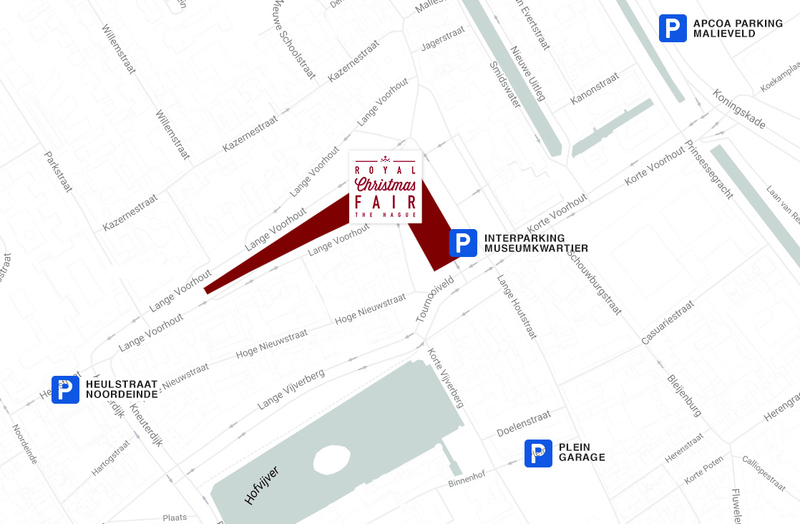 The Royal Christmas Fair lies within walking distance of The Hague Central Station, the major car parks, and the shopping heart of The Hague. During the Royal Christmas Fair, a number of house and behaviour rules apply on Lange Voorhout and in the immediate vicinity. When entering the event grounds, you agree to these rules without exception. Any violation of these rules is on penalty of removal from the site. The police are always notified in cases where we detect an offence. It may happen that your identity and age are checked, and that you are frisked at the entrance or on the premises. You are required to cooperate with such a check/search. If you refuse this, you may be refused entry, or you may be removed from the premises. You are obliged to follow the instructions from the organisation and other authorised persons.